You might not be surprised by the amount of times I hear people tell me that I must hate Canada to not live here anymore. However, that couldn’t be further from the truth. To me, Canada is easily the greatest country on the planet. We have some of the most beautiful natural scenery in the world, a wealth of healthy wildlife, some vibrant cities, and a population of some of the nicest, most caring, people in the world. I love this country with everything I have, and I am insanely proud to come from such a special country. Although I may only be in this country a couple days a year, each of those days spent on Canadian soil is as precious to me as those spent on exotic lands. In fact, because I am away so much I might appreciate these moments more than I would have otherwise. This was the first time I spent Canada Day in Canada for 3 years, and I felt privileged, and a little bit emotional, to be able spend it on home soil. Taking photos of fireworks really isn’t as challenging as you might think. When it comes down to it, the most important thing is figuring out where the fireworks will be shot from so you can form a composition. In this photo of the fireworks on Canada Day in Tofino, I set up along a fence from a viewing area and tried to capture the landscape and the fireworks. I also tried to place the fireworks at the 1/3rds mark of the photo, although this image shows them a little bit farther to the edge. Anyways, you’ll want to use a long exposure to capture multiple fireworks if possible (I used a 30 second exposure here), so you’ll need your tripod and a trigger. You also might want to compensate your exposure by underexposing by one or two stops if you’re reading the light without the fireworks in the shot. Then, the truth is, getting a cool photo of the fireworks really comes down to a lot of luck since you can’t control where the firework go and which ones are set off. That’s all for me! Happy Canada Day! 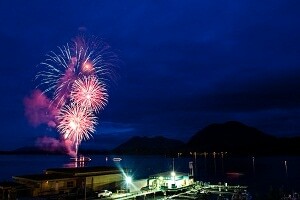 I love your shot and wouldn’t have guessed that a small place like Tofino offered a fireworks display. Hi Leigh – Thanks, yeah I’m sure that the influx of tourists in Tofino makes it more possible to host something like that. They were a small display, but since they shot them off the barge it made for a great scene. Hey Brendon, remember me? I was standing beside you as you took this shot and we were chatting about your worldly travels. It was awesome to meet you and to hear your travel stories. Safe journeys my friend and hopefully our paths will cross again. ekosi. Randy – Good to hear from you! Thanks for the well wishes and hope you’re enjoying the coast! Thanks Tom – You’ll have to make it to Canada, and in particular the Rockies and the coast of BC. It really is spectacular around every corner. i love seeing the fireworks.. and this one is really fantastic.. happy canada day!!! No worries Julie – Truth is that you can set your exposure and scene, but you have no control over what they are going to shoot out there… so you really don’t know what fireworks are going to look good in the shot. Anyways, there’s a lot of luck in photography in general. All you can do is set your gear right, control what you can and then wish for the best :D.